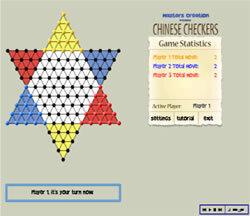 Chinese Checkers or Stern-Halma is a simple, fun, and easy to play. A perfect game to spend your free time with your family and friends. You can even play against computer. Enjoyable game I never played before, unfortunately I got an error halfway through the game for clicking in a bad place. But I did get good use out of the tutorial, and will challenge the AI again at some point. A challenge! The AI actually plays a pretty mean game, but the music had me turning the sound off quickly and the colours made things a little difficult to see. Unfortunately this marred the game somewhat for me, which is a shame as the AI is impressive. I haven't played this or the real-life Chinese checkers in forever, but from the comments I see, it must be good. Maybe this could be used as a mini-game in an actual adventure game in the future. Nice simulation of a interesting game. The tutorial is clear and graphics are nice. Try it!